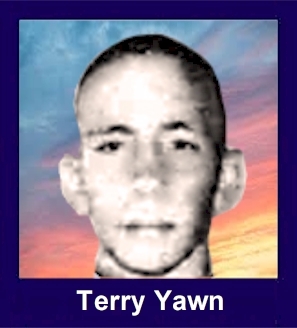 The 35th Infantry Regiment Association salutes our fallen brother, PFC Terry Lynn Yawn, who died in the service of his country on April 27th, 1967 in Quang Ngai Province, Vietnam. The cause of death was listed as Small Arms/AW. At the time of his death Terry was 20 years of age. He was from Hawkinsville, Georgia. Terry is honored on the Vietnam Veterans Memorial at Panel 18E, Line 105. The decorations earned by PFC Terry Lynn Yawn include: the Combat Infantryman Badge, the Bronze Star with V, the Purple Heart, the National Defense Service Medal, the Vietnam Service Medal, the Vietnam Campaign Medal and the Vietnam Cross of Gallantry with Palm Unit Citation. PFC Terry Yawn and I while on a recon patrol came upon a trench that was freshly dug and covered with palm leaves. We came under fire from an enemy sniper. As I engaged the area where we thought the sniper was, Terry spotted him and jumped up and dove in front of me catching a round in the chest. Terry died within minutes. I carried Terry from the battle field the mile back to friendly lines. PFC Terry Yawn didn't just die. He gave his life so that I might live. Terry was a true friend and a real HERO! God watch over him. Award of The Bronze Star Medal for Heroism, General Orders 1715, 4th Inf. Div. For heroism in connection with military operations against an armed hostile force in the Republic of Vietnam. On 27 April 1967 Private First Class Yawn distinguished himself while serving as a Grenadier in a squad-size patrol belonging to Company B, 2nd Battalion, 35th Infantry, operating near Duc Pho. The squad's mission was to find the enemy, and then to destroy him by calling in artillery and armed helicopters. It was following an enemy unit of unknown size, attempting to establish definite contact. As it crossed a trench line in pursuit of this force, the enemy opened up with a small arms and automatic weapons fire, pinning the squad down. Private First Class Yawn reacted decisively, running forward to an uncovered position to provide suppressive fire on the enemy. He was mortally wounded in this engagement, but his heroic action had distracted the enemy and allowed the patrol to break contact and move to a location from which armed helicopters and artillery could be directed against the enemy positions. Private First Class Yawn's dauntless courage and devotion to duty are in keeping with the highest traditions of the military service and reflect great credit on himself, his unit, and the United States Army.